“And this is the promise that he hath promised us, even eternal life” (1 Jn. 2:25). Carlos was a 10-year-old who liked to run, jump, and play. He also liked to ask lots of questions. His Primary teacher loved him. She would often say to him, “It is very important for you to learn the things we are teaching in Primary. Someday you will grow up to be a priesthood holder, a father, and a leader in the Church, and you will need to know these things.” Carlos thought that his teacher was telling him that just so he would be reverent. However, he began to listen and learn. When Carlos grew up, he did receive the priesthood, he became a father, and he was called to be a leader in the Church. He remembered what his Primary teacher had said to him, and he was glad that he had listened and learned. Heavenly Father has a plan for us. He told us about His plan when we lived with Him before we came to earth. When we learned of His plan, we were so happy we shouted for joy! His plan includes being part of a family. He also planned that we would be able to choose between right and wrong. He planned for Jesus to come to earth and show us how to choose the right. If we have faith in Jesus and follow Him, Heavenly Father has promised us that we will be happy and live with our families, Heavenly Father, and Jesus eternally. 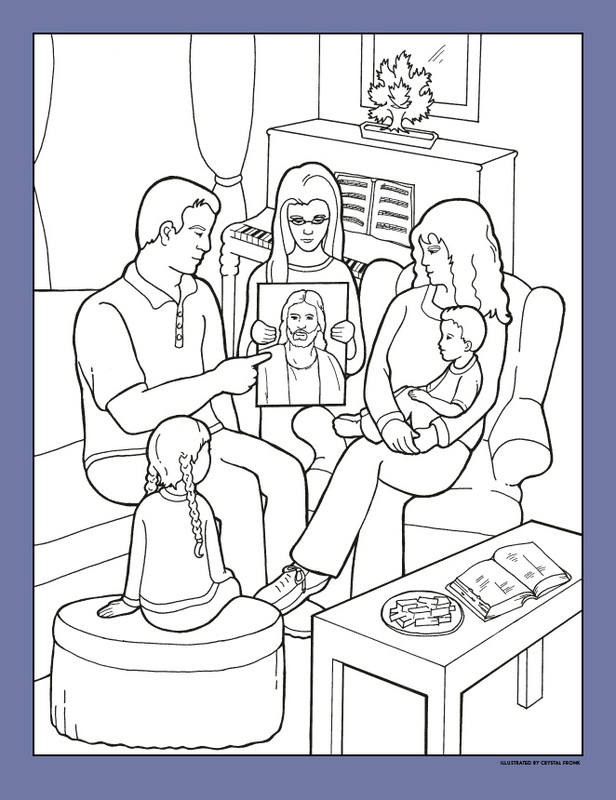 Color the poster on page F4; then mount it on heavy paper. Hang it up where it can remind you to follow Heavenly Father’s plan for you. 1. Place Gospel Art Picture Kit 239 (The Resurrected Jesus Christ) at the front of the Primary room. Prepare six large paper circles. Cut each circle in half. On six of the half-circles, write one covenant (tithing, baptism, sacrament, Sabbath day, Word of Wisdom, temple marriage). On each of the other half-circles, write one scripture reference that tells a way to keep a covenant (Mal. 3:10; Mosiah 18:10; Moro. 4:3; D&C 59:9–13; D&C 89:5–21; D&C 131:2). Place the half-circles in two columns on the chalkboard or bulletin board. Have the children take turns looking up one of the scriptures and reading it aloud. Then ask the group to identify the covenant it matches. Choose a child to represent all of us when we come to earth. Have the child stand at the back of the Primary room. As a match is made, connect the two halves of the circle and place it on the floor, making a pathway for the child to walk on. The path leads back to the Savior. As we make and keep covenants, we can return to live with Him. If time permits, sing songs to reinforce each covenant. 2. Arrange well in advance for three or four adult members of the ward or branch to help in sharing time. Give each of them a copy of My Gospel Standards, and ask them to think of experiences they can share with the children, demonstrating when living the standards blessed their lives. Note which standards they plan to speak on. In sharing time post a copy of My Gospel Standards. Pick songs or hymns that will give musical clues to the standards chosen. Play one musical clue for the children until they guess the appropriate gospel standard. Invite the child who guesses correctly to read the gospel standard. Invite one of the adult members to share an experience about how living that standard blessed his or her life. Occasionally have the children sing the musical clue song. Continue the game as time permits. Bear testimony of the happiness that can come as we live My Gospel Standards.